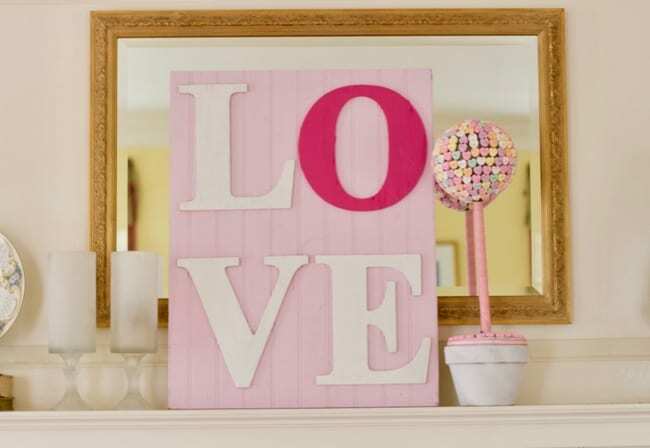 In just a few hours you can make these adorable and inexpensive Valentines Day Mantel Decor ideas. From a Conversation Heart Topiary & Dollar Store Mosaic. Either way to can pair these Valentines Day Crafts with the LOVE Letter Board we made a few years ago. 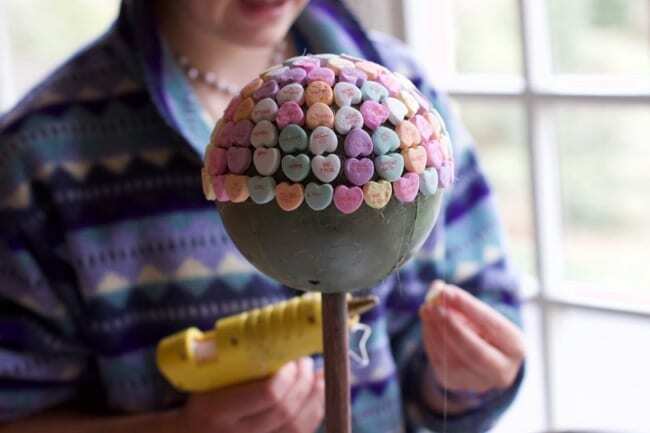 Be sure to check out our adorable DIY Valentines using Melted Crayons too. 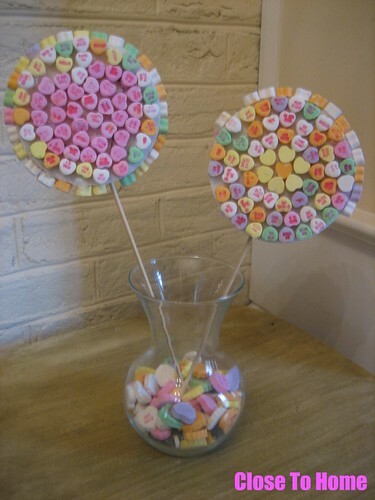 Simply add some hot glue onto each conversation heart candy piece and place in rows. We spray painted the ceramic pot and added ribbon to the wooden rod. While it looks cute on its own, I think with the addition of the Sign Board for a complete mantel look. Several years ago we made a Valentines Day Mosaic from items from the Dollar Store. My kids and I were in the Dollar Store looking for an Valentine Card idea for my son. He was thinking golf but we actually settled on something else that we will be working on soon and sharing. However, while we were there I picked up a few items that I thought I would experiment with and make a Valentine’s Day decoration. For $3 I bought a bag of small conversation hearts, 1 bag of the large conversation hearts and 2 styrofoam discs. My son needed to be diverted from his siblings that afternoon so I called him into the kitchen to help. We started hot glueing the candy on in a circle and then I thought why not make a heart in the middle. I drew a heart in the middle and he filled them in with pink candies. (next time I will turn them over so it is one solid looking heart instead of the distraction of the words. Then fill around them and on the sides Then simply stick a bamboo skewer or wooden dowel into the disc and attach with more glue if needed. I started to make another one and at the end thought I would make a solid picture. Here is what I came up with, much cuter with the solid color amongst the worded ones. 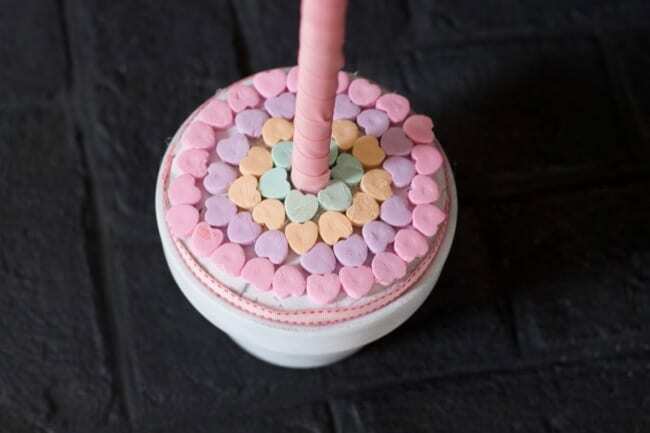 Put the large smarties and some rocks at the bottom of a glass vase to stabilize your skewers. 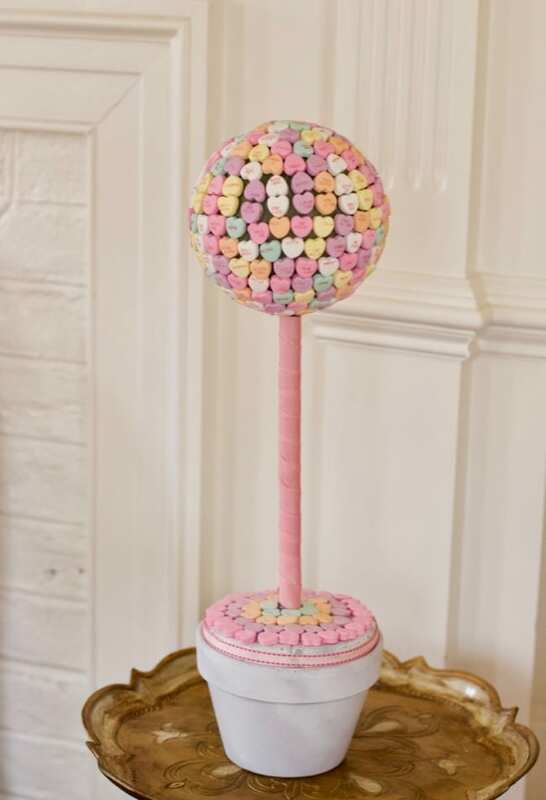 In just a few hours you have yourself adorable and cheap centerpieces. These are pretty heavy so the styrofoam helped them for turning. Since my are going to be facing a wall we did not cover both sides, I just added some felt to the back help it appear darker. You will need 2 bags of the small hearts if you want to cover both sides of two discs. I can’t believe these are conversation hearts are no longer available. I wish I bought more before I used them to make a Valentine Mantel piece. Maybe it will be a relic one day!